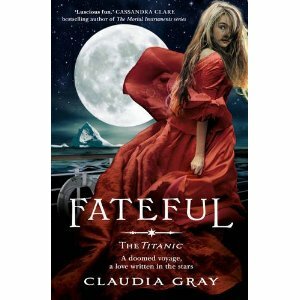 "A tragic tale about falling in love on the world’s most infamous ill-fated sea voyage as heroine, Tess, discovers darker secrets that lie beneath the doomed crossing… and a hidden brotherhood that threaten to tear her lover from her forever. Tess and Alec fight the dark forces threatening to tear them apart, never realising that they will have to face an even greater peril before the journey is over…"
For many years now I have had quite, shall I say morbid fascination with the Titanic. The whole idea of this stunning ship that was supposedly unsinkable, meeting its demise on its very first journey is absolutely amazing & ironic. Now to add in Claudia Gray's fabulous imagination and some paranormal twists, makes for an even more exciting and intriguing tale. This really is right up my street!!!! I am soooo obsessed with the Titanic, so when I saw this post I got really excited!!! I am definitely adding this to my TBR list. Thanks so much for sharing it!!! I saw this one on someone's WoW last week. Great pick. Stunning cover. Mixing so many elements should make for an interesting story. I so want that dress - and the book! This sounds like an interesting read. These flowy red dresses are becoming quite the thing for book covers. I wonder if, in 2013, we'll see the same dresses redone in other colors.